We are most grateful to those who came to their doors to listen to us (especially Fiona and Steve Dickinson who provided hot sausage rolls and mulled wine), and to the Village Hall Management Committee for providing mince pies and (more!) mulled wine when we returned. Most of all we thank those who donated so generously - we raised the magnificent sum of £120.49, which will be divided between All Saints and the BeAttitude project at St Mary-le-Wigford, which works with homeless and other vulnerable people. We'll be back next year...! We will be singing carols around the village on 23 December. All are welcome to join in – the more the merrier! Please meet at 5 pm outside the village hall. A torch might come in handy, and please wrap up warmly as 'in the bleak midwinter' doesn't just apply to Bethlehem! There will be mulled wine and mince pies afterwards in the village hall. 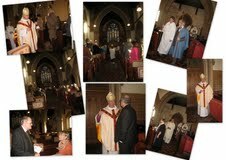 What a wonderful occasion it was last Sunday, when around 60 people, led by Bishop Christopher, gathered in All Saints to give thanks to God for 150 years of Christian service since the church was dedicated on 16 December 1862. 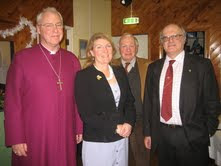 Bishop Christopher was assisted by his Chaplain, Sal MacDougall, Les Whitfield and Tim Thompson. Jill Whitfield played the organ. Ann Kennedy acted as verger, Elsie Horton and Gill Stokes read the Lessons, Liz Murray served, and Nicholas Bennett sang beautifully during Communion. The atmosphere was full of joy and the morning was crowned by a splendid lunch in the Village Hall - many thanks to Sue, Carol, Ann, Doreen, Ruth, Elsie and everyone else who played such an important part in preparing this! Bishop Christopher and Mrs Lowson were able to join us for the lunch and it was good to meet them in a more relaxed setting. It was fantastic to welcome our friends and supporters including Miles Hobart-Hampden, the 10th Earl of Buckinghamshire, whose family has so many connections with Nocton. He and Chris Howard are distantly related, both being descended from the 3rd Earl, although as Chris explained, his descent was apparently via a chambermaid rather than the 3rd Earl's wife. Miles has been researching the family's history and shared some of his findings. Marianne Overton, our County Councillor, made a presentation to All Saints on behalf of Lincolnshire County Council, offering the Council's congratulations on our 150th anniversary. We look forward to the 200th anniversary! Latest Nocton Doodle now out! Click here for the latest village newsletter. All Saints celebrates the 150th anniversary of its consecration on 16 December. The Bishop of Lincoln has graciously agreed to to lead the celebration service, which is at 11 am (not the usual 9.30). This will be followed by a celebration lunch in the Village Hall. Further details to follow but please mark the date in your diary now. Around 45 people attended the Harvest Thanksgiving service on Sunday 30 September to give thanks to God for all His gifts. The church looked lovely and a selection of produce was on display. This was later auctioned at the Harvest Supper, Nicholas Bennett acting as auctioneer. Another career beckons, Nicholas! The supper was also well attended and featured local delicacies such as Lincolnshire chine, followed by the usual delicious crumbles and pies, and, of course, Lincolnshire plum bread with cheese. Almost £400 was raised for the church restoration fund. Thanks to all who donated produce or dishes for the supper, decorated the church, did the washing up or helped in any other way! Link to the June 2012 Nocton Doodle here ! 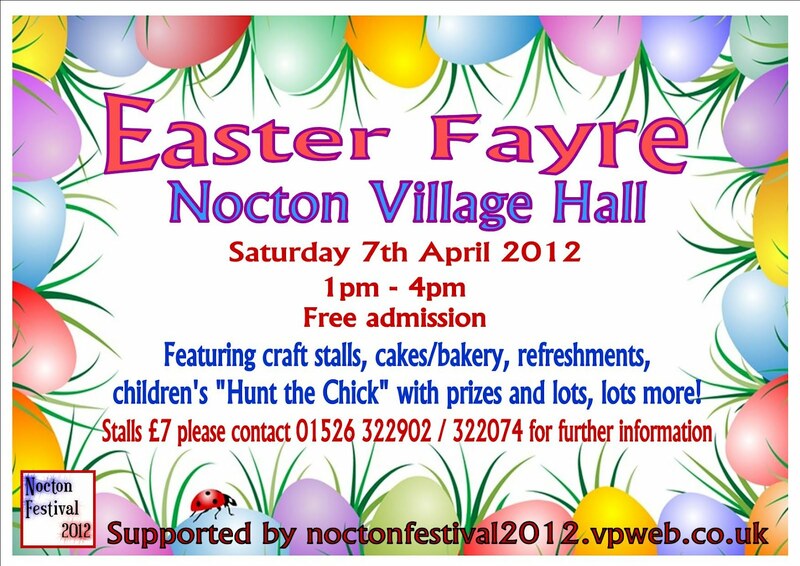 Nocton's Flower Festival starts in just 12 days! Preview Evening starts at 7.30 pm, admission is by ticket only. Tickets include wine and canapes and cost just £5. Church open 10 am - 5 pm for viewing, refreshments and plant stall. Why not buy a combined preview/ concert ticket for just £12? I thought this deserved a post of its own. Doesn't it look splendid? More about the Flower Festival concert! Lincoln Minster School Chamber Choir Concert on Saturday 30 June in Nocton Church, 7.30p.m. Six months ago this choir premiered a new work by Howard Goodall CBE, composer of the signature tunes for Blackadder, The Vicar of Dibley and Mr Bean. They were summoned to Westminster Abbey to sing the first performance of Every Purpose Under the Heaven, with words from the King James Bible. They will sing selections from this piece as part of a varied programme of choral music at our Flower Festival concert. Don’t miss the chance to hear this outstanding school choir, in which many ex-Lincoln Cathedral Choir choristers sing. Tickets are £9 (Supporters £8), and children 16 and under are free. Why not buy a combined ticket to the Flower Festival Preview and the concert for just £12? Our wonderful village church needs your help! make a cake or two? Flower Festival - only 3 weeks to go! The finest Gothic Revival church in Lincolnshire is undergoing major repairs to preserve it for future generations. Tickets £9, Under 16s Free, Supporters £8. English Heritage awarded us a large grant towards the restoration work, and as part of this agreement we need to have the church open for a set amount of hours each year. We therefore would like people to offer to man the church during these compulsory open times. No prior knowledge is needed, nor is this only open to church members, all are welcome! We are in the process of setting up a cleaning rota, again non church goers are very welcome. If you have a few hours to spare please contact me. Many hands make light work! You don’t need to work alone in the church as we could arrange for you to work with someone else. A verger is needed for occasional offices (weddings, baptisms, funerals). This involves opening up, preparing the church and locking up again afterwards. Sometimes it would be helpful to stay for the actual service and assist by handing out hymn books and collecting them in. A fee is payable. Church goers and non church goers are welcome to apply. The church played an integral part in Nocton’s wonderful Royal Garden Party. Our grateful thanks go to Jilly Burr for all the effort she put into restoring the model coronation coach which was on display in the church. It was truly spectacular and the village is fortunate to be the guardians of such a special model. Thank you to Carol for the cups of tea! 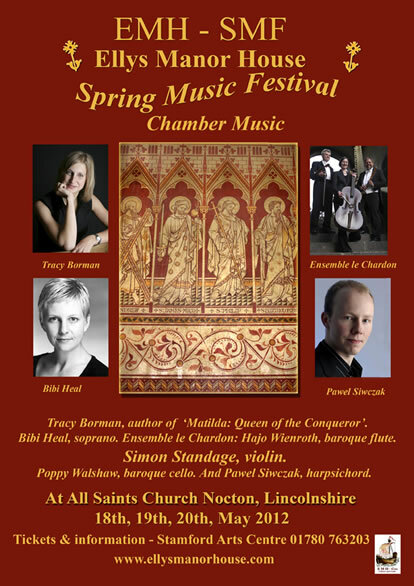 Three first-rate chamber music concerts were given in Nocton church over the week-end of 18 to 20 May, in the Ellys Manor House Spring Music Festival. The organiser was Clive Taylor, who greets visitors to his home built by Anthony Ellys in the early 16th-century, the Ellys Manor House in Great Ponton. Clive was looking for a church with a family connection, and his research led him to our village, where a kinsman of Sir Anthony, Sir Richard Ellys, lived in Nocton Hall in the 18th century. On the Friday evening, Bibi Heal (soprano), Hajo Weinroth (Baroque flute), Poppy Walshaw (Baroque cello), and Pawel Sjwczak (harpsichord), performed music by Bach, Handel and Couperin, with the theme of ‘Desire and Contentment.’ Handel’s ‘Soft Complaining Flute’ brought out the mellow tones of the Baroque flute, the sound of which was copied by the harpsichord. The same musicians gave the concert entitled ‘Voices of Nature’ on Saturday evening. Nightingales, roses and the human soul were evoked in a collection of Baroque miniatures. Then Bibi and Pawel left, and Simon Standage arrived on Sunday afternoon for an all-Haydn programme of divertissements and trios for flute, violin and cello. Their playing was flawless, a sheer pleasure to listen to. The musicians praised Nocton Church’s fine acoustic, suggesting that it should be made available for recordings. Clive’s team of caterers provided excellent canapés and wine, and although the weather was cold, the atmosphere inside the church was warm and friendly. 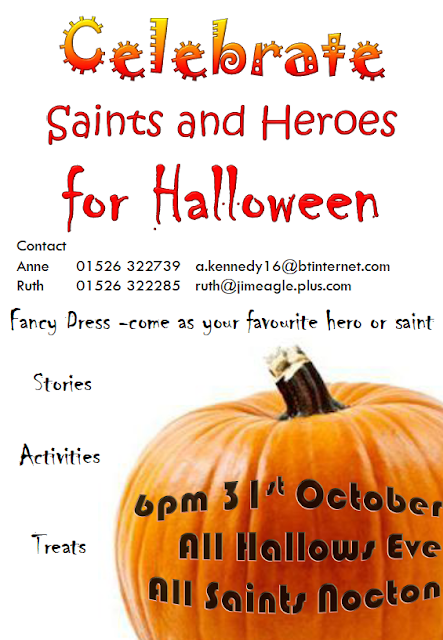 All Saints will benefit from providing the venue, and this is especially helpful towards paying for urgent repairs. It would be a pleasure to welcome this concert series again, and it is hoped that other concert organisers will take note of our very beautiful church interior and great acoustic for chamber music. The re-roofing of Nocton Church’s nave and chancel roofs, begun last July, has been completed by the addition of a new Ancaster stone cross. The original Victorian cross at the west end of the nave fell down in a storm around eighteen years ago. Paul Mendham Stonemasons took a rubbing of the surviving cross at the east gable of the nave and later carved a copy of it for the west end. The new cross was put into place on 3 May. The dates ‘1862’ and ‘2012’ are carved on it, to mark the 150th anniversary of the finest Victorian Gothic Revival church in Lincolnshire. The cross stands about five feet high, and can be seen from a distance when approaching Nocton village. Having received generous grants from English Heritage and the Lincolnshire Churches Trust among others, people in the village are continuing fundraising efforts to cover the costs and VAT of the roofing and the new cross, the installation of new lighting in the chancel to show off the ceiling and roof timber decoration, and the renewal of stencilling around the east window. Still to come are the restoration of the figures of two apostles in the chancel wall paintings, drainage works, and repairs to the disabled ramp and churchyard light. Donations have been coming in to help meet the target of £40,000. Coming up soon in Nocton Church is the Ellys Manor House Chamber Music Festival. On Friday 18 May at 7 p.m., Saturday 19th May at 7.30 p.m. and Sunday 20th May at 4 p.m., Clive Taylor of Ellys Manor House is putting on a concert series of music for voice and ensemble by among others, Bach, Handel and Telemann, performed on baroque cello, harpsichord, flute and violin, by artists of international standing. For information and tickets, phone Stamford Arts Centre on 01780 763203, (www.ellysmanor.com). 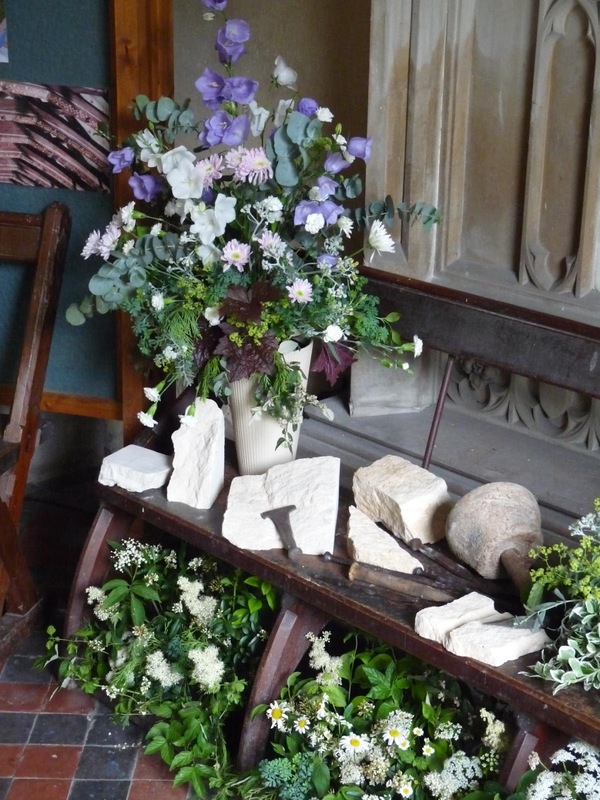 The Nocton Church Flower Festival Weekend runs from Friday 29 June to Sunday 1 July 2012, with the theme of ‘Our Village in 1862: Celebrating Nocton Church’s 150th anniversary.’ On the Friday at 7.30pm is the Flower Festival Preview Evening. Admission (by ticket only) is £5, including wine and superior canapés. 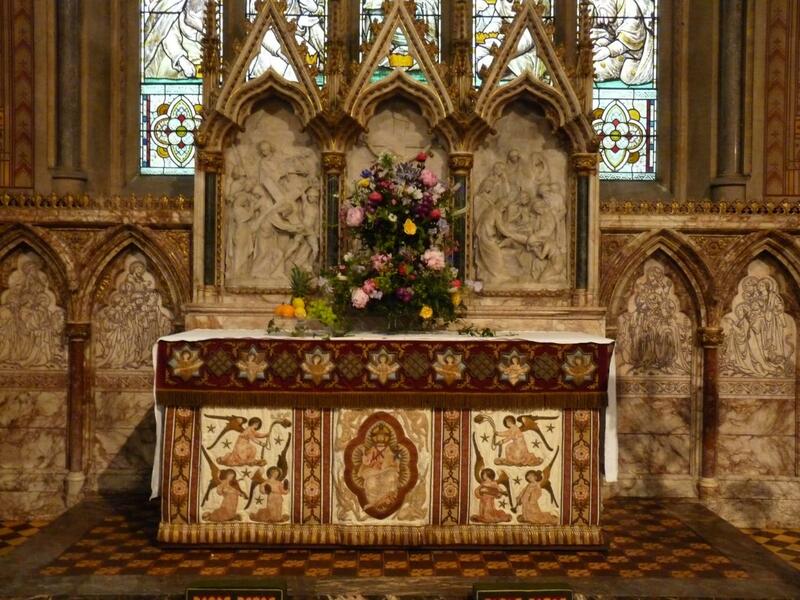 On Saturday 30 June, and Sunday 1 July, the church is open for visitors to the Flower Festival from 10 a.m. - 5 p.m. There will be refreshments on sale and a plant stall. On Saturday evening (30 June) at 7.30 p.m., the Lincoln Minster School Chamber Choir (Choir of the Year 2010 category finalists) will give a varied concert of choral music, catering to all musical tastes. Tickets are £9, (under 16s free). The combined ticket price for the preview and concert is £12. The Flower Festival will close on Sunday 1 July at 6 p.m. with a Service of Songs of Praise. Tickets are available from Sue Morris (01526 321455). 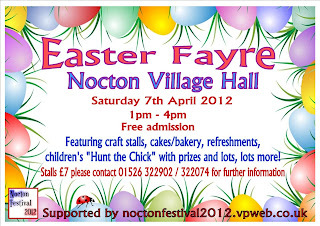 For more information see www.nocton-church.blogspot.com and www.noctonfestival2012.vpweb.co.uk. Sorry to be a little late in posting the link. I will try harder next time! At last the work is nearly finished! We would like to invite all our friends to see what we have been up to on Saturday 12 May 10 am - 4 pm. A large number of people have helped us with the project and we will be saying a public thank you to them at 2 pm. Refreshments will be available throughout the day. Please come and join us! 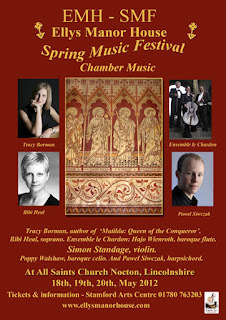 Ellys Manor House Spring Music Festival comes to Nocton! This finest Gothic Revival church in Lincolnshire is undergoing major repairs to preserve it for future generations. This will be held in church on Wednesday 18 April at 7.30 pm. First, the churchwardens for the coming year will be elected. Following the election of churchwardens, the APCM itself takes place, at which, amongst other items, the Parochial Church Council is elected for the next year. Anyone resident in the village is entitled to attend and you will be welcome whether or not you are a churchgoer. 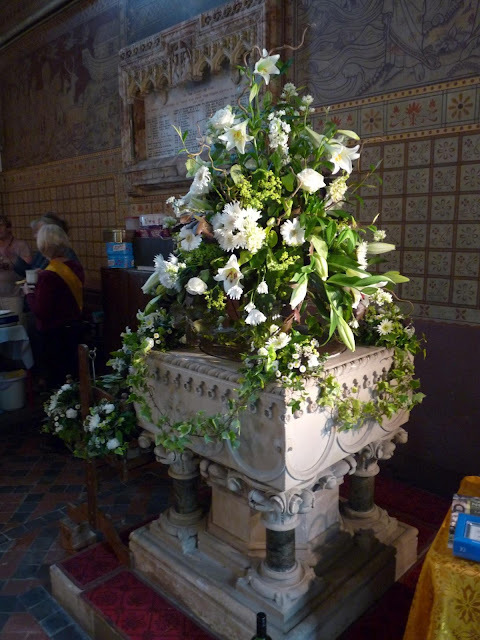 The Easter acclamation rang out in All Saints, the church newly decorated with flowers for Easter. It looked lovely - thanks to all who helped. 41 people attended the service to celebrate the resurrection of Jesus Christ. That's what Easter is about! Not Easter eggs or cute bunnies, but God sending his own Son to redeem mankind from our sins. 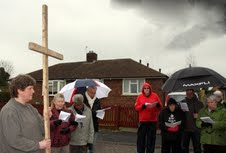 A damp but determined group of people, including some from Nocton, set off under cloudy skies for a Walk of Witness around Branston. We started and finished at All Saints Church with prayer, between which times we walked around Branston behind a cross, stopping at a number of locations to remember the Stations of the Cross. Each stop included a reading from the Bible and a few hymn verses. Some passers by looked bemused; others watched from behind their curtains. Canon Bryan Barrodale's traffic stopping technique (standing in the middle of the road with cape billowing, shepherding his flock across) was memorable. It was good to show the villagers that there is a Christian community locally and to remind them of what Good Friday is really about. Our Maundy Thursday commemoration of the Last Supper was made extra special by being in our newly reopened church. Rev Les Whitfield led the service and performed the traditional act of washing the feet of two of the congregation (Rev Tim Thompson and Ann Kennedy). Nicholas Bennett provided musical leadership, including singing psalm verses (with perfect timing) during the Stripping of the Sanctuary, which left the high altar stark and bare. The service ended, as is traditional, in the silent departure of the congregation. On February 20th we celebrated the licensing of the Reverend Canon Nick Buck as Priest in Charge of the benefices of Branston and Metheringham. The Reverend Sister Liz CSF was also licensed as Assistant Curate of the six parishes (Branston, Potterhanworth, Nocton, Metheringham, Blankney and Dunston). Sister Maureen and Sister Judith were commissioned for ministry in the deanery. This well attended service was held at St. Peter's Dunston. It was a truly joyful and welcoming service. We all continued to enjoy the evening at the Methodist chapel, with tasty refreshments and lots of chat. The restoration work is progressing well. Work on the north side of the nave roof is nearly complete. Smaller repairs, eg to the pulpit and lamps are also being addressed. It is hoped that most of the work will be finished by the end of March. We are planning to be in the church cleaning on Saturday March 31st and Sunday April 1st starting at 2.00 pm. It is extremely likely that the builders will be back working on the church on Monday morning. So if you are able to help at all please come along. We will need lots of helpers. Any queries please phone - Ruth Tel. 322285 or Nicholas Tel. 322930. Please bring any cleaning equipment eg dustpan and brushes, dusters, buckets etc. We are hoping to celebrate Easter in our beautifully restored church on Sunday April 8th at 9.30 am. We look forward to seeing you there. Easter Fayre - please support this! Calling All Potential Flower Arrangers! Would you like to help decorate our beautiful church? All Saints organise a monthly flower arrangers rota and some new helpers would be wonderful. Everyone is welcome - you do not need to be a "church goer". If you would prefer not to be responsible for a month you can share or help. Previous experience is not necessary! We're getting the church back soon! Volunteers are needed for the weekend of Saturday 31 March/Sunday 1 April to start to get the church fit to be used. The builders will still be working on the west end of the nave roof, but we will be able to get in and use the building. The first scheduled service at the moment is the Maundy Thursday Celebration of the Last Supper and we definitely plan to be back in church for the great celebration of Easter Day. Please come and join us on the 31 March/1 April for the great 'get the church back' clean. Details of times to be announced shortly. On Monday 20 February, Rev Canon Nick Buck will be licensed as Priest-in-Charge of the benefices of Branston with Nocton and Potterhanworth, and Metheringham with Blankney and Dunston. At the same service, Sister Liz of the Community of St Francis will be licensed as Assistant Curate to the two benefices. The service will take place at Dunston St Peter's at 7.30 pm. We hope that as many people as possible will attend the service to welcome Canon Nick Buck and Sister Liz into their formal roles; they have been supporting us informally for some time! The Baptism of Ryan Grant Bassett (aged 7 months) of Parklands Avenue, Nocton took place at St Andrew’s Church Potterhanworth on 18 December 2011. Ryan is the son of Andrew and Sarah Bassett and his godparents are Emma Mathewson and Martin Davies. The Revd Les Whitfield officiated. Ryan’s elder brother, Owen, was baptised at All Saints’ Church, Nocton in December 2009. Welcome Ryan! The latest edition of the Doodle is now available! Click here for lots of news on what's happening around the village.